Graduate school is a lot of work. While the type of work varied throughout my first three years here, expectations remained high. These expectations are what drives us to do great research and hopefully make significant changes in the lives of patients who need new treatments. But the stressful atmosphere can be overwhelming. For those who are unfamiliar, the “Mass Effect” series is a science fiction-based game set in a world just beyond the recognition of the one we live in today. Space travel is common and alien races abound, as does conflict. While some may see the game as a mindless mashing of buttons, I found it both entertaining and enlightening. Video games constantly get a bad rap. Critics claim they increase violent acts or encourage an inactive lifestyle. But I see them as a remarkably underutilized resource. 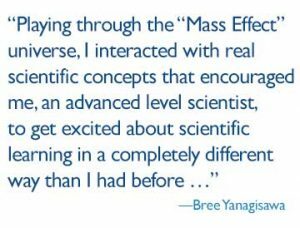 Playing through the “Mass Effect” universe, I interacted with real scientific concepts that encouraged me, an advanced level scientist, to get excited about scientific learning in a completely different way than I had before — an idea I found highly intriguing. In a world where the scientific community is becoming more specialized, the scientific literacy of the general population is only decreasing. And, unfortunately, it is becoming harder and harder to attract young people to science, a field generally considered more intellectually challenging than other required courses. But if we could use an outlet that already attracts so many youth as a catalyst for encouraging interest in science, we could not only inspire scientific literacy at a young age, but also potentially lead children to seek out this knowledge on their own. To that end, many companies have been creating stimulating educational games that can be incorporated into classrooms. In fact, NASA just recently launched an alternate reality game called “DUST” to encourage science engagement in high school-age children. Another company, GlassLab Games, partnered with “SimCity” developer EA Games to create a modified version of “SimCity” to teach children how the effects of pollution can affect town infrastructure and vice versa. 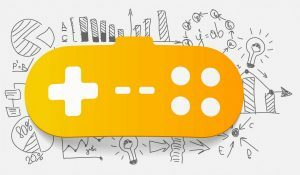 Though these examples are encouraging, the concept of using video games to promote science literacy is still in its infancy. But the potential to promote science as a fun learning experience for younger generations is an exciting one. I’m anxious to see what we can do with it.